The key players in the global dental 3D printing market are 3D Systems (US), Stratasys (US/Israel), Renishaw (UK), Roland DG (Japan), SLM Solutions (Germany), EnvisionTEC (Germany), DENTSPLY Sirona (US), Straumann (Switzerland), Formlabs (US), Prodways Group (France), EOS (Germany), Rapid Shape (Germany), DWS (Italy), Planmeca (Finland), Kulzer GmbH (Germany), Ultimaker (Netherlands), Dental Wings (Canada), Carbon (US), and Asiga (Australia). The global dental 3D printing market is projected to reach USD 5.06 billion by 2023 from USD 1.78 billion in 2018, at a CAGR of 23.2%. 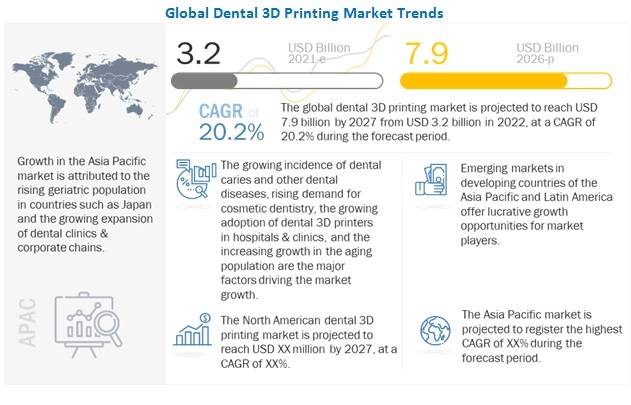 Market growth can be attributed to the increasing adoption of the dental 3D printers in dental hospitals and clinics, the significant increase in the geriatric population, and increasing disposable income is leading to the increased dental expenditure resulting in the utilization of digital dentistry. 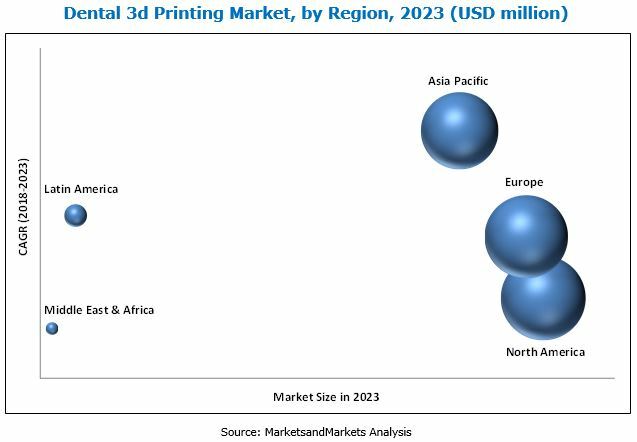 However, reimbursement scenario and stringent regulatory process for the approval of 3d printing equipment may hinder the growth of this market during the forecast period. The report analyzes the global dental 3D printing market, by product and service, technology, application, end user, and region. By product and service, the services segment accounted for the largest share of the market in 2017. The large share of this segment can be attributed to the increasing outsourcing done by the small dental clinics, dental hospitals, and dental laboratories to the dental 3D printing service providers. Based on technology, dental 3D printing market is segmented into vat photopolymerization, fused deposition modeling, selective laser sintering, polyjet technology, and other technologies. The vat photopolymerization segment accounted for the largest share of the global market in 2017. The large share can be attributed to the high precision and accuracy of this technique. By application, the dental 3D printing market is divided into prosthodontics, endodontics, and implantology. The prosthodontics segment accounted for the largest share of the market in 2017. The growing edentulous population is one of the major factors driving the growth of this application segment. In addition, the introduction of advanced technologies such as CAD/CAM and the rising adoption of dental 3D printers and scanners have significantly improved prosthetic dentistry procedures. This is a major factor supporting the large share of this application segment. On the basis of end user, the dental laboratories segment dominated the dental 3D printing market in 2017. The large share of this segment can be attributed to increasing number of dental laboratories, rapid adoption of advanced technologies by dental laboratories across the globe, the increasing outsourcing of certain manufacturing functions to dental laboratories, and rising demand of customized/fabricated dental framing solutions required for various applications. Geographically, the global dental 3D printing market is segmented into North America, Europe, Asia Pacific, Latin America, and the Middle East and Africa. North America holds the largest share of this market in 2017. This is primarily due to the rising incidence of dental caries and tooth loss associated with the aging population, growing oral care expenditure, technological advancement, increasing demand of cosmetic energy, and rising popularity of digital dentistry. Asia Pacific region is expected to grow at a higher CAGR during the forecast period. In current scenario of the dental industry, there is demand for fast production of highly customized dental products. Since, the 3D printing is a well-established option for faster production of the customized parts, easy to use, highly accurate, and cost effective 3D printing solution are being increasingly preferred over the milling-based methods. The technology advancements in hardware, materials, and the software are driving the adoption of dental 3D printing & scanning equipment. The key players in the dental 3D printing market include 3D Systems (US), Stratasys (US/Israel), Renishaw (UK), Roland DG (Japan), SLM Solutions (Germany), EnvisionTEC (Germany), DENTSPLY Sirona (US), Straumann (Switzerland), Formlabs (US), Prodways Group (France), EOS (Germany), Rapid Shape (Germany), DWS (Italy), Planmeca (Finland), Kulzer GmbH (Germany), Ultimaker (Netherlands), Dental Wings (Canada), Carbon (US), and Asiga (Australia).